Essential PDF allows you to create the table with DataSource from DataSet, Data Table, arrays and IEnumerable objects using PdfLightTable class. It allows you to perform simple formatting. In Silverlight, Windows store apps and Xamarin only strongly typed IEnumerable objects are supported. The below code snippet illustrates how to create a simple table from a data source using PdfLightTable. // Initialize DataTable to assign as DateSource to the light table. //Include columns to the DataTable. //Include rows to the DataTable.
' Initialize DataTable to assign as DateSource to the light table. 'Include columns to the DataTable. 'Include rows to the DataTable. You can directly add rows and columns instead of a data source, by setting DataSourceType property to TableDirect of PdfLightTableDataSourceType Enum. The following code illustrates how to add the data directly into the PdfLightTable. //Set the Data source as direct. 'Set the Data source type as direct. You can create table using PdfLightTable in the existing document by using the following code sample. PdfGrid allows you to create table by entering the data manually or from an external data source. The DataSource can be a data set, data table, arrays or a IEnumerable object. The below code snippet illustrates how to create a simple table from a data source using PdfGrid. 'Set DataSourceType to the light table. You can set the data directly without setting any data source using PdfGridRow and PdfGridColumn classes. The below code snippet illustrates how to create the simple table directly using PdfGrid. You can create table using PdfGrid by loading the IEnumerable data source. Refer to the following code. 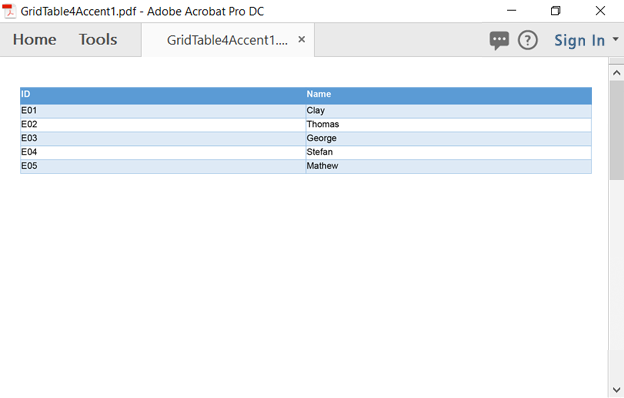 You can create a table using PdfGrid in the existing document by using the following code sample. PdfLightTable allows users to customize cell font, background, border, etc. using PdfCellStyle class. The below code snippet illustrates how to customize the cell properties in PdfLightTable. //Set the DataSourceType as Direct. //Create the font for setting the style. //Declare and define the alternate style. //Declare and define the header style. 'Set the DataSourceType as Direct. 'Create the font for setting the style. 'Declare and define the alternate style. 'Declare and define the header style. You can set different styles for particular cell using BeginCellLayout and EndCellLayout events in PdfLightTable class. The following code example illustrates how to draw the graphics elements in particular cell using these event handlers. PdfGridCell provides various direct options to customize cells like ColumnSpan, RowSpan, text color, background color, and etc. The following code example illustrates you how to customize the cell in PdfGrid. //Set the value to the specific cell. //Set the value as another PdfGrid in a cell. //Specify the style for the PdfGridCell. //Set image position for the background image in the style. 'Set the value to the specific cell. 'Set the value as another PdfGrid in a cell. 'Specify the style for the PdfGridCell. 'Set image position for the background image in the style. PdfLightTable doesn’t provide direct support for row customizations. However, this can be done through the event handlers.The following code snippet illustrates how to customize the row in PdfLightTable using BeginRowLayout and EndRowLayout event handlers. // Set just spanned cells. Negative values are not allowed.
' Set just spanned cells. Negative values are not allowed. The following code snippet illustrates how to customize the column in PdfLightTable using the PdfStringFormat class. You can customize row height and styles using Rows property in PdfGrid class. The following code snippet illustrates how to customize the row in PdfGrid. //Add columns to the DataTable. //Set style for the PdfGridRow. 'Add columns to the DataTable. 'Set style for the PdfGridRow. You can customize column width and text formats using Columns property in PdfGrid class. The following code snippet illustrates how to customize the column in PdfGrid. Essential PDF supports users to create a customizable PDF table like CellSpacing, CellPadding, RepeatHeader, ShowHeader, etc. This can be achieved by using the PdfLightTableStyle class. The following code snippet illustrates how to customize the table using PdfLightTable. Essential PDF supports users to create a customizable PDF table like CellSpacing, CellPadding, HorizontalOverflow, etc. This can be achieved by using PdfGridStyle class. The following code snippet illustrates how to customize the table using PdfGrid. In-built table styles can be applied to both PdfGrid and PdfLightTable models and the appearance is made similar to Microsoft Word’s built-in table styles. You can also apply in-built table styles with the following additional table style options. The below code example illustrates how to apply built-in table style using ApplyBuiltinStyle method of the PdfGrid with styles from PdfGridBuiltinStyle Enum. 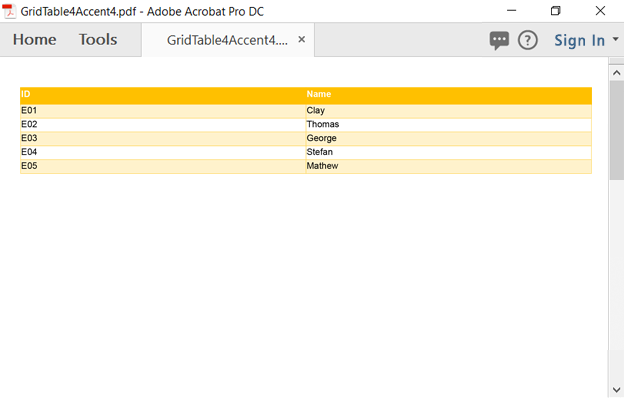 The following image shows the PDF document with PdfGridBuiltinStyle.GridTable4Accent1. The below code example illustrates how to apply built-in table style using ApplyBuiltinStyle method of the PdfLightTable with styles from PdfLightTableBuiltinStyle Enum. The following image shows the PDF document with PdfGridBuiltinStyle.Gridtable4Accent2. The below code example illustrates how to apply built-in table styles with table options to the PdfGrid. 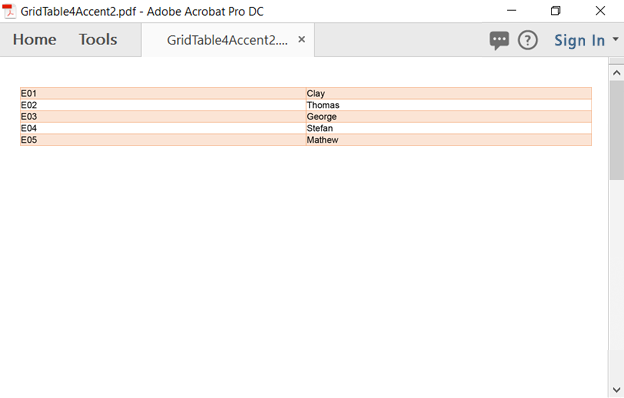 The following image shows the PDF document with PdfGridBuiltinStyle.Gridtable4Accent4. Essential PDF provides support to paginate the PdfLightTable using PdfLightTableLayoutFormat class. The below sample illustrates how to allow the PdfLightTable to flow across pages. // Initialize DataTable to assign as Date Source to the light table. //Include columns to the Data Table. //Set properties to paginate the table.
' Initialize DataTable to assign as Date Source to the light table. 'Include columns to the Data Table. 'Set properties to paginate the table. Essential PDF supports to paginate the PdfGrid using PdfGridLayoutFormat class. The below sample illustrates how to allow the PdfGrid to flow across pages. //Set properties to paginate the grid. Both the PdfGrid and PdfLightTable models are supported across all the platforms and the below table explains the level of customizations both the models provide.